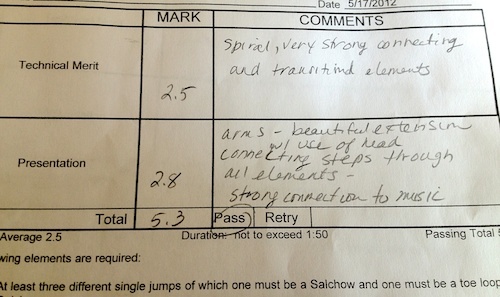 Pacific Coast Adult Sectionals are in just over a week! There’s so much more I wish I had time to polish up, but on the other hand my program has improved a lot from a few weeks ago. Coach Ty helped me make this video today. One of the obvious problems on this run-through is that I didn’t finish in time, which is an automatic deduction. My lutz (the second jump) was OK this time, but it’s inconsistent. I’d also like to fix my arms: often when they are supposed to be on a diagonal, they are both somewhere in the middle. Ty has been helping me on my sit spin/back scratch spin combination, working on getting the transition from one foot to the other quicker and more decisive. He said I had taken one and a half rotations to change feet, but the spin doesn’t count as a combination unless the change takes half a rotation or less. The sit spin itself is not very low, I’m not sure if it will even be considered to be a sit spin. I’m in the Bronze Ladies IV group, ages 51-60, and I hope they will cut our group some slack on the depth of the sit. On the plus side my footwork sequence has improved. The counter is truer and I’ve been able to skate through the footwork with more speed and ice coverage. 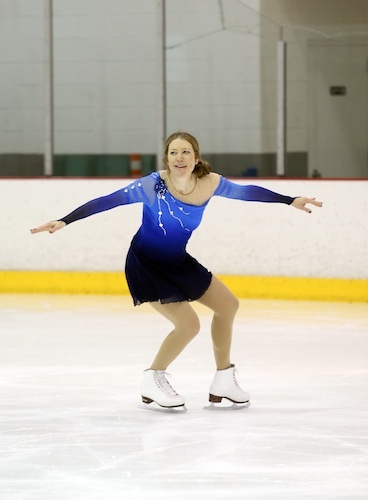 On this run-through I knocked my free skate into my skating foot during the footwork, which was…. interesting… but no real harm done. I’m glad Ty shot this run-through and not the next one where I fell out of my Ina Bauer. Not sure how that happened, but at least I got up and finished. Today I picked up my dress for this routine from Kim of GlittRSkatewear and I’m so pleased! It’s a lot like the sketch but with the addition of blue flowers on the shoulder. And she made me a flower hair tie too. I love Kim’s designs and her sewing, she really goes the extra mile to make something special. Physically I’ve been holding up well. I’ve been doing PT for my Achilles tendonitis and posterior tibial tendonitis and it’s close to gone. Even after the first PT visit I’d say it was about 50% better. 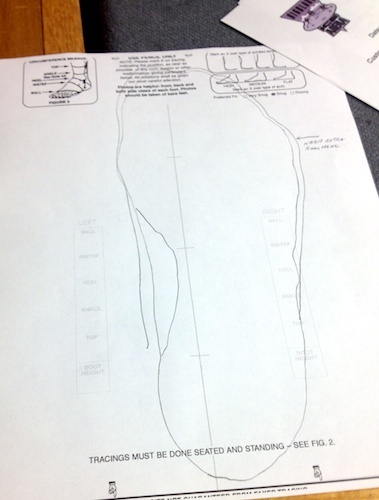 The custom Superfeet that my skate fitter made for my skates may be part of what’s helping. My PT Jen massaged my heels and showed me a stretch to do on the stairs. Even though I already do a lot of stretching, including calf stretches, this particular exercise seemed to help a lot more, perhaps because it uses body weight to get a deeper stretch. She also had me do heel raises three ways: with my feet parallel, turned out, and turned in. On other visits PT assistant Allen did massage on my heels and calves with these gua sha tools which really got the gritty knots out of the calf muscle. He showed me lunges with one foot up on a stair, with various twists, to stretch out the front and sides of my hips and hip flexors. They are best stretches I’ve ever had for this purpose. On the skate front, my new Harlick skates are ordered and I chose Reidell Eclipse Titanium blades. Tomorrow I’ll wear my new skating dress to practice and run through my program in it. Can’t wait to show it to coach Lisa! The program looks great Mary! I’m so excited for you! Beautiful dress! Thanks Marcia! It’s nice to hear that from a skating coach like you! Thanks, Eva, I hope so! The coach who will put me on the ice in CA just took a look at the video, says he wants to change that scratch spin to a sit/scratch for more points. Not sure I want to change it so late! How exciting that it’s so close!! Best of luck! That’s so exciting!!! Oh my gosh! Wow that is awesome that you are doing this!! You are so talented at it and I love the dress design you’ve chosen. Thanks Jen, and thanks for the good wishes for the competition. Stretching is very important and for someone like you who skates I advice you should do the hip flexor stretching in every warming up and stretching you normally do like what your PT has taught you . The hip carries the most pressure in our lower body especially when you’re skating. With that preparation and training not to mention that lovely dress I bet you won the trophy for the sectionals. I am a bit late on reading this post, any good news to share?